»The soothing Turahalli forests; The last standing forest in Bangalore! The soothing Turahalli forests; The last standing forest in Bangalore! We all have our own reasons for loving the majestic city of Bangalore! It could be the pleasant weather, diverse food joints, cultural blend or certain emotional aspects. This garden city once had a brimful of lakes, forests and other natural splendours which are swiftly fading now. But Bangalore has hidden a secret in it's vests which most of us are unaware of! Turahalli forests is the last standing forest in the city of Bangalore. Also called as Karishma hills, the forest is situated in the Kanakapura road. Turahalli forests is one of the best offbeat places to visit in Bangalore, thanks to the lush greenery and picturesque views it bestows. Let's take a tour through one of the best offbeat destinations in Bangalore - The Turahalli Forests! The Serene and Soothing Turahalli Forests! Turahalli forests is the perfect getaway if you are looking for an escape from the hurry burry of the city! The serene and tranquil environ will definitely impress you. Turahalli forests is the last remaining wilderness space close to South Bangalore which attracts climbers, birders, cyclists and nature enthusiasts alike. The forests is also one of the best trekking places in Bangalore and has one of the best cycling trails in Bangalore. Turahalli forests is probably the only place where you can get jungle like experience. The forests with some hillocks offer a scenic view and is considered to be one of the best offbeat places to visit in Bangalore. Turahalli is one of the best trekking places in Bangalore which offers a perfect one day trek! A short hike will take you to the top of the hillocks which provides a 360 degree view of the Bangalore city which skirts it. A bird view of the Bangalore city! Exciting enough? The best cycling trails in Bangalore! The Turahalli forests is one of the best cycling trails in Bangalore and is an established cycling trail for Bangaloreans. As there are no steep curves or steep heights cycling is quite easy here. The picturesque backdrop add to the merry! Rock climbing, Bird watching and Recreational activities.. The Turahalli forests has in it also for the rock climbers and birders. The boulders of different size and shape attracts climbers here. It is also a birder's paradise! Turahalli forests also serve as a perfect place for recreational activities. People come here for yoga and other recreational activities during the mornings. What a place to meditate! Apart from all these, the arresting sunrise here alone can allure you to visit this place! 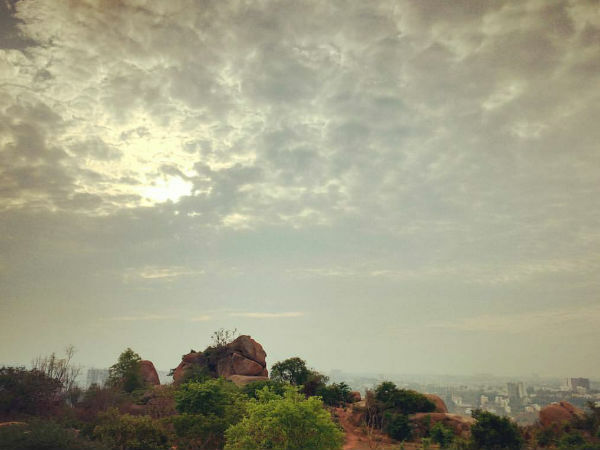 If you have got a thing for nature, this is one of the best offbeat places to visit in Bangalore. Go and soothe your soul. While travelling to this one of the best offbeat destinations in Bangalore , please try not to litter the place. It is our responsibility to safeguard this gem of a place!